St. Leo the Great, Pope and Doctor - My Catholic Life! History has conferred on few popes the title of “Great,” and today’s saint is one of them. Leo the Great’s origins are obscure, so nothing is known of his early life. He was, though, ordained into Holy Orders and rose to prominence as a papal advisor in the 420s. He corresponded with imminent theologians and acted as a papal emissary before he was elected Bishop of Rome in 440. Leo was a pope’s pope. He expanded the power and influence of the papacy at every opportunity. The Church’s earliest theological tradition rooted Rome’s primacy in the double martyrdom of Saints Peter and Paul in the eternal city. No other city could claim to have been sanctified by the blood of two martyrs. Pope Leo, however, emphasized what was to become a more dominant argument for papal supremacy—that the pope’s authority is not rooted in the soil of where Peter and Paul died but on the Bishop of Rome occupying the chair of Saint Peter. By word and action, Leo repeatedly taught that the pope’s power was unequaled and without borders, that the pope was the head of all the world’s bishops, and that every bishop could have direct recourse to the pope, and not just to the local archbishop, in disputed matters. Pope Leo thus accelerated an existing tendency consolidating church governance and authority under a roman umbrella. Regional or even local decision-making by individual dioceses or groups of dioceses did occur. But in important theological, moral, or legal matters that affected the entire church, no bishop or diocese could spin out of the roman orbit. Pope Leo enacted a more aggressive papal role directly overseeing and enforcing discipline over bishops. Leo and his curia intervened in, and settled, disputes. The Catholic Church is not an international federation of dioceses, after all, and needs a strong center of gravity to ensure that centrifugal forces do not unwind the universal church into a galaxy of independent national churches, united in name only, rotating around local axes. Nowhere was Leo’s authority exercised more clearly and successfully than at the Council of Chalcedon in 451. The theological issue at stake concerned Christ’s divinity. Some theologians in the east were espousing the Monophysite heresy, which argued that Christ had only one divine nature. The Council consisted of 600 bishops from the eastern empire with a handful from Africa. Leo sent three legates from Italy who were treated with all honor and respect as representatives of Peter’s successor. They read out loud to the Council fathers the “Tome of Leo” on the Incarnation. The pope’s words laid out, with force, clarity, and eloquence, that Jesus Christ had both a divine and a human nature “without confusion or admixture.” When the legates finished reading, the bishops’ common response to the pope’s words was “This is the faith of the fathers; this is the faith of the apostles… Let anyone who believes otherwise be anathema. Peter has spoken through the mouth of Leo.” The Tome of Leo from then on became the teaching of the Catholic Church. Pope Leo the Great saved Christmas. If Christ were not truly man, or not truly God, the babe in the manger would be just another babe whose birth was no more worthy of celebration than that of Julius Cesar, Gandhi, or Marco Polo. In 452, Pope Leo entered the history books when he rendezvoused with Attila the Hun in northern Italy, convincing him not to sack Rome. A legend says that Attila turned back because he saw Saints Peter and Paul standing right behind Leo. Pope Leo governed the Church as the Western Roman Empire was slowly disintegrating. He was courageous in alleviating poverty, protecting Rome from invaders, and maintaining Rome’s Christian heritage. While outstanding as an effective and practical leader, Pope Leo is most known for the concision, depth, and clarity of his sermons and letters, which led him to be declared a doctor of the Church in 1754. He was the first pope, after Saint Peter himself, buried in Saint Peter’s Basilica. His remains lie under a beautiful marble relief sculpture of his meeting with Attila. 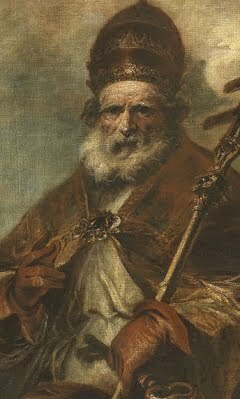 Pope Saint Leo the Great, give to the Pope and all bishops pastoral hearts, sharp minds, and courageous wills, so that they may lead the Church by personal example, by correct teaching, and by their caring little for the criticisms of the worldly.